I was pretty surprised. But neither of us could remember how it might have happened. Too much ice? But there was no sense dwelling on the past. The clock was ticking down to today’s New Year’s Eve. And if frozen concoctions were to be part of the 2006 celebration, I needed to hunt down a new one. I checked with Geri Reikhof, who owns the Bay Leaf, 725 Mass., to see if she could steer my search. Reikhof said she didn’t carry much, except a Cuisinart model that doubled as both a blender and a food processor. And she had some hand-held blenders. However, she gave me two tips on buying a traditional countertop model. Capacity is important. Get one big enough to suit your needs, she said. And she recommended getting a blender designed to hold up to the wear and tear you’ll give it. “A lot of times what happens to people is the motor just poops out,” she said. I also checked out what some consumer Web sites were recommending. The key feature was the “Wave~Action System,” which incorporates new jar, blade and motor technologies to continuously force the mixture down into the blades, eliminating icy chunks. While a lot of blenders have 450 to 500 watts of power, the WaveStation has 700 watts of power, churning up a full jar in 15 to 20 seconds. It also has a “cup-activated” dispenser, which means you push a cup against a lever under the dispenser nozzle. Epinions.com listed the KitchenAid KSB5 Ultra Power 5 Speed Blender as getting four out of five stars after being reviewed by 74 users. I couldn’t find the specs on the motor for the KitchenAid on its Web site, but the manufacturer says that every KitchenAide blender has a “sturdy motor” that delivers the power to crush ice at any speed. The KSB5 model comes with a “StepStart” technology. 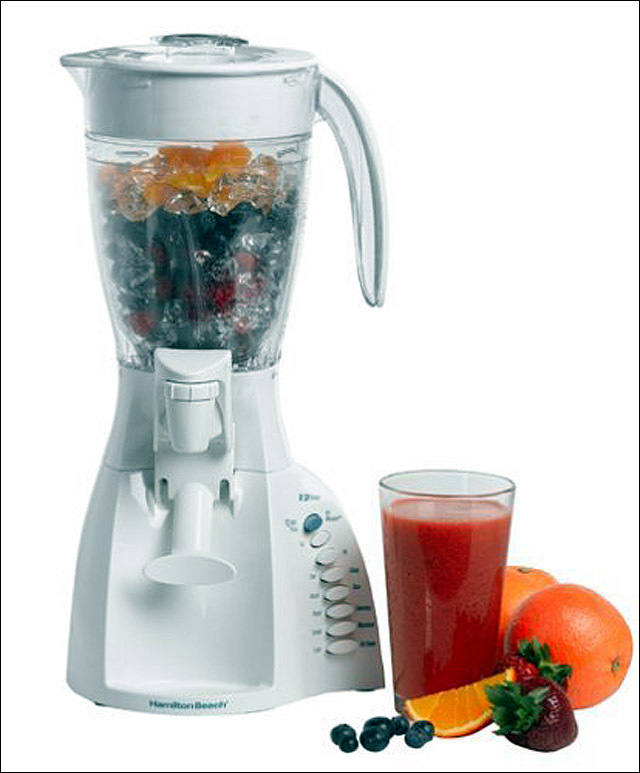 It starts the blender at a lower speed to minimize splattering, then speeds it up. The manufacturer’s cost is $129, but you can find them for about $100 or less online. Consumersearch.com rated the Braun PowerMax MX2050 (about $60) as the best overall out of 55 reviewed, calling it especially good at crushing ice in small batches and blending smoothies with no hidden icebergs. Also, it’s heavy enough that it won’t slowly rotate on the counter. The specs say it combines 525 watts of power, five speeds and a pulse setting. Its carafe holds up to 58 ounces. 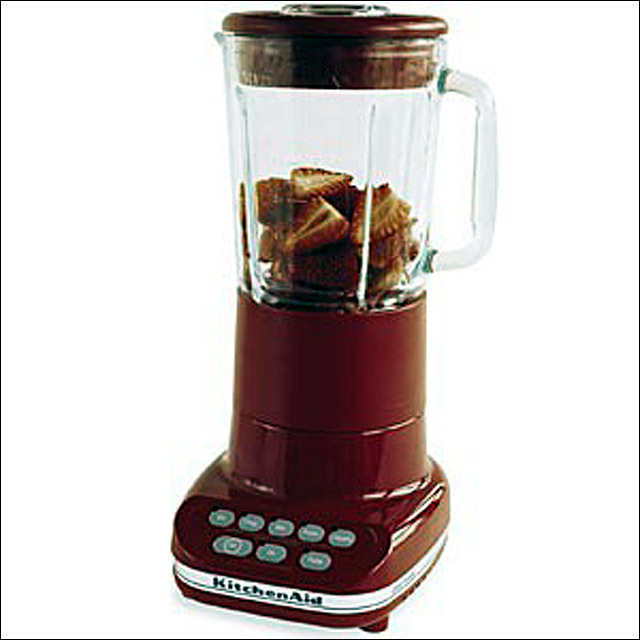 KitchenAid KSB5 Ultra Power 5 Speed Blender received high ratings by Epinions.com. And it said the best budget bar blender is the Oster Classic Beehive Blender, which costs about $65. One of the more unique devices I found was the Byerley Bicycle Blender, or B3.2, at the Berkeley Center for Appropriate Transport (BCAT) in Berkeley, Calif. Think “Gilligan’s Island.” The B3.2 is driven by a friction wheel on the side of the rear tire. Nate Byerley, a 27-year-old inventor, told me he built a pedal-powered bicycle blender because he wanted to combine two of his passions – one for cycling and one for eating well – into one pursuit. Byerley unveiled his first prototype three years ago on a San Francisco bicycle ride that drew about 5,000 riders. He started getting requests for his bike blenders, so after traveling with it in Central America he went into business making them about a year and a half ago. He found they worked best when he built them onto a bike equipped with an Xtracycle, which is an extension to the rear of a bike that makes it sturdier and able to carry a load. The complete unit – with a bicycle, blender and Xtracycle – costs about $1,400 at www.bikeblender.com. Byerley, whose invention has been featured on MTV, has sold somewhere between 50 and 100 of them. Customers include restaurants in New York and Baltimore. “They’re going to be in use in probably a number of New Year’s Eve situations,” he said. Before I went out and got my own new blender for New Year’s Eve, I had to see if I could find the old one. “Are you sure it’s broken?” I called out to my wife after I found it in the back of a utility closet. My daughter Julie, a college freshman, walked in and we started talking about it. Julie had fond memories of homemade Oreo and cookie dough blizzards, chocolate shakes and fruit smoothies my wife made for her and her sisters, Bonnie and Katy, and my son, Matt, over many summers. I filled the plastic carafe with water, plugged it in and started punching buttons. The blades spun and the water churned. “I think it works,” I told my wife. Then it seemed to groan. An oily electrical smoke smell emerged from its base. I shut it off. I guess after several years of churning out happy memories, it had just pooped out.